Nightsteed turned around to face Shad and Saura who had been engaged in an argument about whether to call for lunch or not. Now they had both fallen quiet, staring at him. “Nightsteed,” Saura said, recognizing the dark mane and black hooves. “Sir.” He bowed slightly. Even Shad, who had viewed Nabile as one of their own age and rank, sank a little closer to the ground. This Uni was closer to royalty than Nabile would ever be, only by his attitude. Shad and Saura looked at each other. “Yeah, though his eyes seemed friendly enough to me,” said the Lupe. “Wrong answer?” asked Shad, his ears drooping. 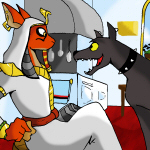 “No you’re not; you’d eat anything that doesn’t scream in your mouth and in case of spooky food that’s no factor either,” hissed the Zafara, peering at Nightsteed who looked a bit friendlier now, though it was a rather small bit. “Ask the scholars in the library how we acted when we were introduced,” suggested Saura, trying to hide his disapproval. After all, Nightsteed most likely had a reason to be suspicious. “What were those books?” was the next question. “Spellbooks, well, one was just an old history book but it had magical power,” remembered Saura. “Do you always need to stick your nose everywhere?” growled the Zafara. “We promise,” the brothers said. Nightsteed’s blue eyes focused for a second and then turned crimson. For just one faint moment his whole body changed; yellowish bone was to be seen through holes in his dark dry skin, partly covered by bandages, and transparent flames rose from his hooves without burning the floor. Then he changed back and stepped backwards, breaking the bond. “I put an old curse upon both of you,” he said. “Break the promise you just gave and you die. It won’t be pretty, that much I can assure you. If you are who you say you are, then you have nothing to fear, but I have my reasons to be careful.” He lowered his head a little – the biggest token of respect one could ever get from him – and left, this time through the door. “Well, wasn’t he nice,” grumbled Shad, his yellow eyes still wide in shock. The two brothers spent quite a while talking. They had a lot to argue about. Having a deadly curse placed upon you isn’t exactly something to be taken lightly. The Xweetok walked quickly and lightly, mainly on her hind legs just like Harfu and Nabile, though at staircases she jumped on the banisters and ran down on all fours, waiting downstairs as the brothers followed her. She was gentle and fragile, and her voice was quiet when she pointed at a statue or a vase here and there in the hallways, explaining how old they were and what they meant as they passed them, yet she seemed proud and confident, as much as a maid can afford those qualities. When she opened a gigantic door in a hallway that looked bigger and more luxurious than most others, she bowed again, said: “May the Faeries bless your meal,” and left with a straight back, her mane flowing behind her like liquid chocolate. The dining hall, though immense, somehow managed to look balanced and full of furniture. The walls were bordered with golden statues that varied with huge windows, there were huge palm trees growing in equally huge pots in each corner of the room, and the oaken dining table itself, though long, had two rows of comfortable chairs to counterbalance the effect. The room was light and all the golden surfaces were shimmering in the afternoon sun – and there were indeed many golden surfaces in that room. Nightsteed was there too, sitting in a slightly different chair that was designed for him. Shad’s eyes met his for a second when they approached the table, bowed to the others and sat down. The Uni seemed... calm. Not suspicious, not apologetic or grim, but simply aware of the two visitors’ presence and assuming that he wouldn’t have to bother with them in the near future. Nabile introduced the two to the table-company and then spent a good five minutes introducing everyone else. “Boy, this place is a lot fancier than that fortress we last visited,” Shad whispered to Saura, peering around to make sure nobody felt offended by the whispering and nodding at the Grarrl who was currently being introduced. “This is a different land and a different time,” the Zafara replied. “But I like it here.” He focused on the introductions, curious to hear about Nightsteed. “Sir Khnumeran of Qasala, His Royal Highness’ advisor.” A fat mutant Gelert nodded and smiled widely. The brothers nodded back. “Drefu Arafan, Qasalan external affairs.” A skinny, grim Wocky nodded and gave a smile that didn’t reach his eyes. The brothers nodded back. “Nellera, the spokesperson for Her Highness Fyora in Qasala and the delegate of Faerieland.” The Faerie nodded, seeming a bit tired. She was an Air Faerie and the warm, dry air seemed to make her lose her concentration. “Nightsteed.” The blue Uni glanced at the two brothers, his face showing no expressions whatsoever, merely recognizing their presence as much as he needed for the ceremony, then he looked away again, buried in thoughts. Nabile didn’t add anything about him. This was the first time the brothers got to take a good look at prince Jazan. 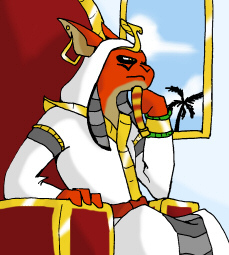 The red Kyrii was leaning against the back of his chair, his simple-looking white robe bordered with gold and his orange eyes bordered with black. He gave a short glance at the two brothers at Nabile’s words, gave a quiet “mhrmmh” and his eyes turned blank again. He seemed bored, and as tired as the Faerie delegate. “It’s an honor, Your Highness,” said Saura, feeling that he should say something. Jazan glanced at him again, this time nodding slightly, then he leaned forward. “Nice, can we start eating now?” His voice was somewhat different from what the brothers had expected, especially judging by his bored and slouchy appearance. It was a deep, strong voice, a voice one would expect to hear from the mouth of a warlord encouraging his men for the final battle, not a bored prince at the lunch table. The doors opened again and a long row of servants came in, carrying dishes and plates. For a while the only sounds were the clatter of forks and knives, the thumps of jugs against the table and a lot of munching, but as the first hunger was satisfied, chatting arose over the table and the atmosphere turned lighter. Nabile used the chance to chat with Shad and Saura, asking them about events in Neopia and laughing at the funny news, even the smallest and most trivial ones. She had clearly missed that information and the brothers were truly glad to be able to help her. The Kyrii shrugged with a somewhat impatient grimace that said “fine, whatever, just leave me alone”. Nabile’s pink face turned reddish when she turned back to Shad and Saura, trying to pick the thread up again as if nothing had happened. Shad helped her out, diving back into the chat with his usual light blabbing, and Saura chimed in every once in a while. The Zafara glanced at Nightsteed for a second. The Uni hadn’t talked much during the lunch, but that was because he wasn’t very talkative in general, and none of the advisors by the table seemed too comfortable with talking to him either. He had been sitting and eating, and he was currently gazing at Jazan as he munched on his qando stew. Nightsteed’s eyes were full of deep, sad concern.